Police outside Colombia’s capital on Monday retained hundreds of victims of ongoing armed conflict in the west of the country for two days, refusing them entry to Bogota until Monday. The 500 members of three indigenous communities had walked 300 miles from the jungle region near the Panamanian border in the north of Choco to flee violence and attend a meeting with authorities. The men, women and children were stopped by police outside the capital though, and left without food, water and blankets. I don’t understand why they kept us since last night, we come from Choco so the national government would help us, would keep its word. A day after the ONIC denounced that the police refused the victims’ freedom of movement, and the people had run out of food and water, police allowed the communities to pass. 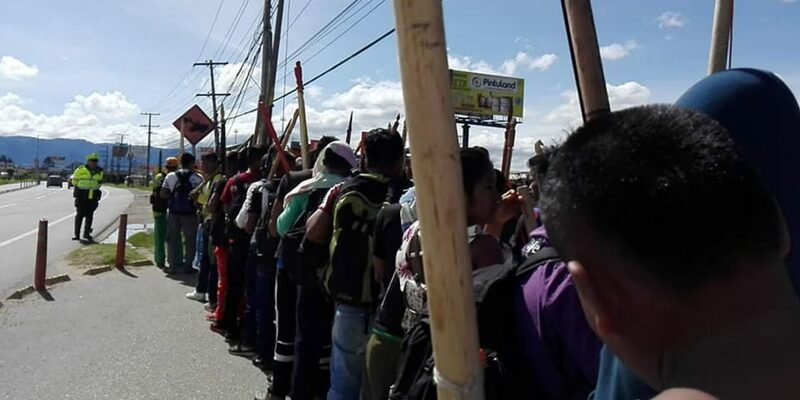 We urgently request that the national government of Ivan Duque and the Mayor’s Office of Enrique Peñalosa provide the necessary guarantees for the indigenous peoples who arrive in Bogota. We also need them to show their willingness to talk in order to comply with the agreements already reached with these communities. The communities and the ONIC had convoked a meeting with national authorities for Tuesday about the displacement caused by ongoing combat between ELN guerrillas, rearming FARC members and AGC paramilitaries that is terrorizing the people in the border region. The AGC, a dissident group from the AUC paramilitary organization, spurred much of the displacement after accusing the communities’ leaders of being FARC leaders. Even after having ended their 300-mile trek and endured hunger and thirst on the way, the displaced peoples’ suffering was far from over after they arrived in Bogota. According to ONIC, the government representatives did show up at the meeting in Hotel Inter on Tuesday morning. By 3PM, however, the rights group said that the government representatives refused to make sure the displaced peoples could have shelter or blankets while in Bogota. The displaced people are from an area that is tropical rainforest while temperatures in Bogota can drop to around freezing point at night, which poses a major health risk for the displaced. The region in Choco where the indigenous and Afro-Colombian communities live is of particular strategic importance for the illegal armed groups because of its drug and human trafficking routes to the Pacific coast and Panama. 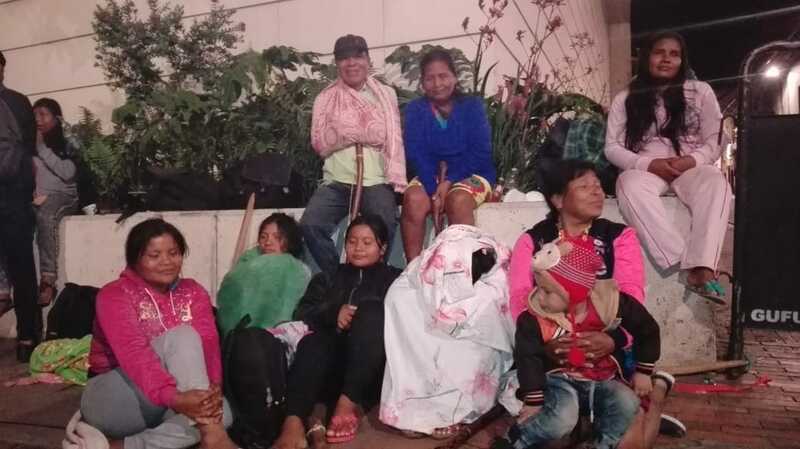 National authorities have historically failed to assume territorial control over the border region, leaving the communities that live in the jungle area at the mercy of illegal armed groups that have been at war for years. Duque has long rejected the peace process with the FARC and his administration has failed to continue with the execution of the peace process, which has skyrocketed the rearming of demobilized guerrillas, also in the north of Choco.